I’m shopping now because when it comes to outdoor living stuff, summer may be for entertaining, but winter is for buying! This is an especially good time for buying BBQ’s. Big sales start in November at BBQ’s Galore. Ace Hardware and big boxes like Home Depot and Lowes will also soon be clearing out the BBQ’s to make room for heaters and fireplaces. Here’s how to buy a BBQ. The first thing you need to do is figure out what your needs are: What kind of foods do you cook? How many people do you cook for? How much space do you have? Do you prefer wood, briquettes or gas for fuel? Will it be built-in or free standing? How much money can you spend? And lastly, how do you want it to look. Answer these questions and you will narrow down your appropriate choices. I had a Hibachi when I was in college and it worked fine for my needs then (one small, food-stamp steak at a time.) Then I graduated, got a job and moved up to a three-legged red Weber with removable lid. When I got married, my wife brought home our first propane BBQ from Costco and I spent an entire Super Bowl assembling the damn thing. The Raiders beat the Redskins that year! Over the last 35 years, every one of those old BBQ’s corroded away to nothing-from the inside out. Now, for perhaps my last BBQ purchase, I want something more durable. Plus, I now have way more experience with outdoor cooking and let’s just say I’ve developed more specific needs. I’ll share them with you below. Your needs may vary. I like the gas models. They light quickly, easily and don’t smoke. The smell of starting fluid and the ordeal of cleaning out ashes turns me off. I also prefer gas because I can control the heat better and vary the size of the cooking surface areas. If I’m cooking one steak or burger, I just use one small corner of the grate. I’ve decided to shop for a 36” wide stainless-steel model with a rolling base. There are bigger models available, but for the cooking my wife and I do, 36” is perfect. We usually just grill for ourselves, but at least once a month, kids and grandkids show up in a hungry hoard, so we need to be prepared to crank out half a dozen steaks and burgers when that happens. Most BBQ’s are made to look spectacular while sitting in the store. But don’t be fooled by looks. The real quality of a BBQ is way down on the inside… hidden from your prying eyes. 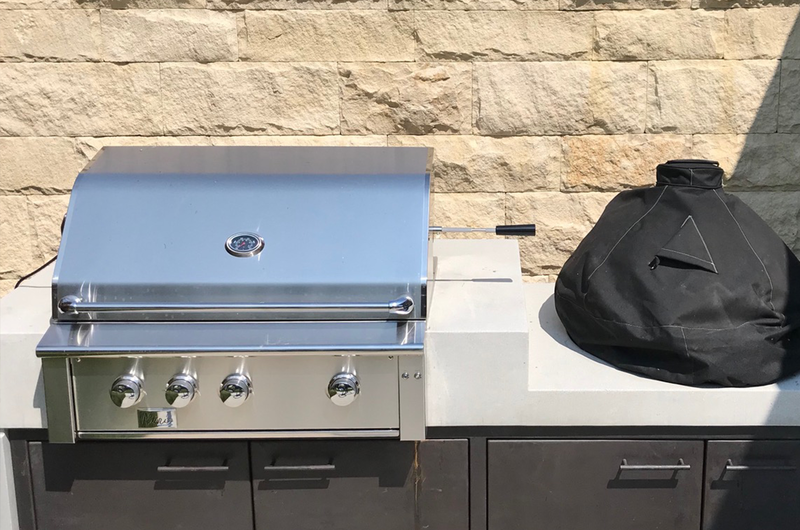 Most mass produced, low-cost gas BBQ’s use cheap, inferior materials down in the bowels where important parts like the grates, burners, shields and drip pans are located. Poor materials here will immediately begin to corrode and eventually completely decompose over an arrestingly short time. As they disintegrate, problems begin to crop up with lighting, uneven cooking and total flame failure. My first old gas unit got so bad that I was finally cooking on just one small corner in the right front part of the grate. 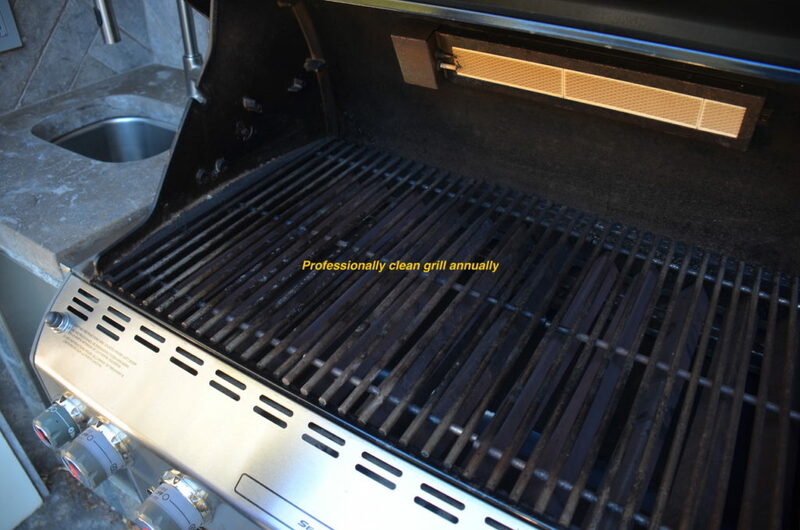 To learn if a BBQ has durability, check the reviews and read the specs. Warranties can also tell a story. Prices though can be misleading. Some makers put a lot of emphasis (and high prices) on style with very little actual value in durability. Frankly if I’m going to spend $1000 or more on a BBQ, it better last. I definitely want a stainless steel BBQ, but not 430 stainless. 430 is the grade used for dishwasher interiors and refrigerator skins. It’s better than painted metal but not much. On the other hand, ignore hyper-marketing that touts “304 Stainless Steel” as something outrageously awesome. 304 is standard stainless material. That said, it’s better than 430. The best to pay attention to the thickness of the metal. You will want 16 or 14 gauge or lower (lower gauge means heavier/thicker) and more durable material. If you live on the coast or anywhere subject to salt or corrosive air, I’d get 316 stainless steel That is the best material for corrosion resistance and is considered the “marine” grade stainless. Unfortunately, I have only seen a couple of models made from 316 stainless steel. One is from Blaze and can be purchased with confidence at BBQ Guys. It is a 32” unit and I am strongly considering it. Another is a Heston stainless steel work of art, and yet another is from American Muscle. Kalamazoo makes one that costs over $30,000. It looks to be excellent, but I won’t be ordering that one as it costs more than my patio. Besides good material, I’m looking for excellent build quality too. The unit should have nice welds or rivets, strong fittings, cast bronze, stainless or ceramic burners, and an all stainless-steel interior, including grates, shields, trays and other parts. A rotisserie is a nice accessory to have, but side burners, warming trays and browning grids are seldom used, so I will skip those items. 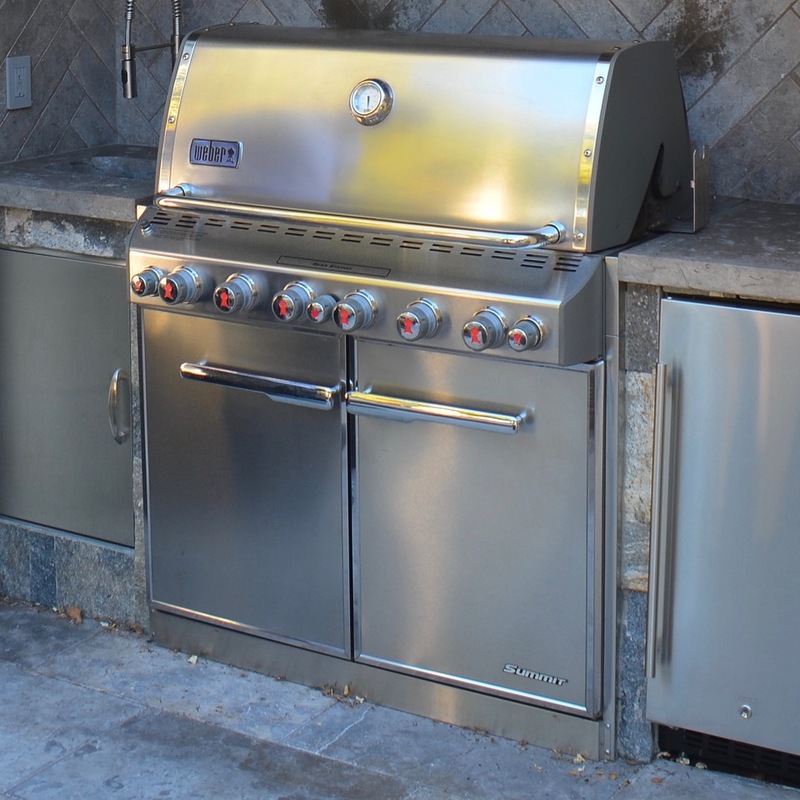 I do want the BBQ mounted on a heavy duty rolling stainless cabinet. There are things I need to store close-by so a cabinet, preferably with drawers, is a nice feature. Plus, I like to be able to wheel the BBQ around on the patio from time to time. BBQ’s are messy and notoriously hard to maintain so I want to get one that disassembles easily for cleaning and replacing parts. For my HPS clients in the Bay Area I utilize a company called Sparkle Clean. This company comes to the property and services our grills once a year. They set up a cleaning station, disassemble the BBQ, do a heavy clean, replace any defective parts, then reassemble and test so that its ready for the next season The service costs about $300 plus parts. Having a like-new BBQ at the beginning of each season is well worth it. 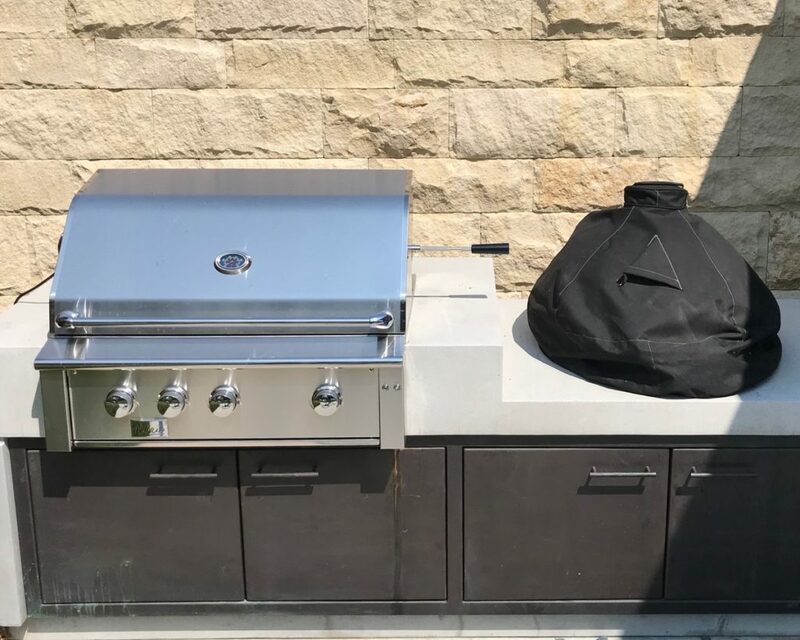 When not in use, I recommend fitting the BBQ with a nice-looking protective cover. Better BBQ’s come with cover. If your does not, you can get a custom-made cover from Couverture. This is likely the last BBQ I’m going to buy so I’m going about this seriously. Now, it’s time to go shopping. I’ll let you know how it goes and what I bought later. Thank you for taking time to use my free website. I spend a lot of time working on this, so if you find the information here of value, the best way to help me continue is to please share the pages of this site (along with any kind words) with others. You can easily share what you find here on all your favorite social media sites, or just email the link to your friends. I am well over retirement age now and still working, so your support of this website will really help my eventual retirement. The very best help to me is when you use my recommended links when you decide to buy anything. Using a link will cost you nothing, yet it is a great source of support for this site. The linked resources always have the best quality, prices and service, which is why I use and recommend them all personally.